• Generate quality leads for the Air National Guard. eshots deployed QuickCapture mobile technology with a game-like feel. 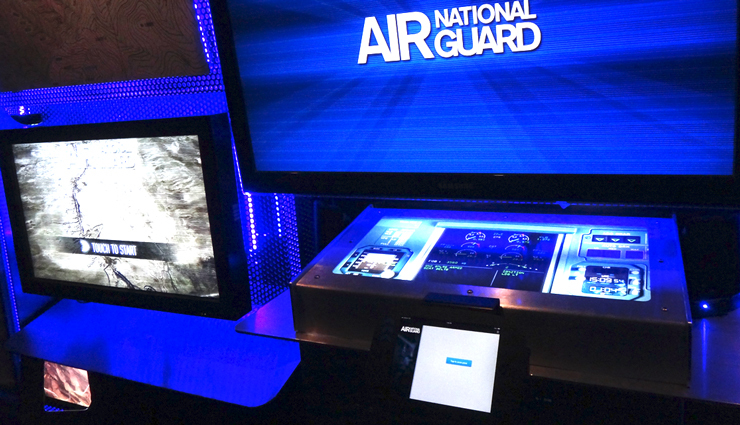 Consumers interacted with each device by playing games, answering survey questions and/or taking a photo while increasing their knowledge about the Air National Guard. 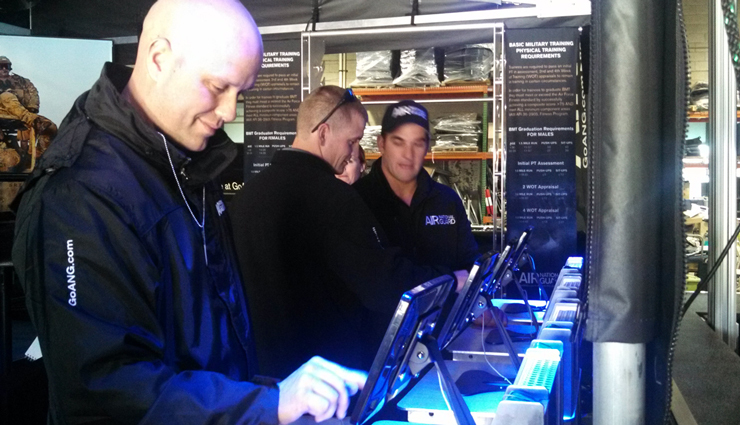 eshots was able to integrate each station onsite with a pass for a seamless experience. Consumers entered their information once and scanned their pass for speedy throughput. They left each event with an excitement about the brand and key takeaways along with a collectible item mailed to their home for a personalized touch. The collectible item was also incentive for the consumer to provide accurate lead information. 6: Exit interview with a member of the Air National Guard Team. The surveys were used on eshots hardware and also downloaded on four agency-owned devices. 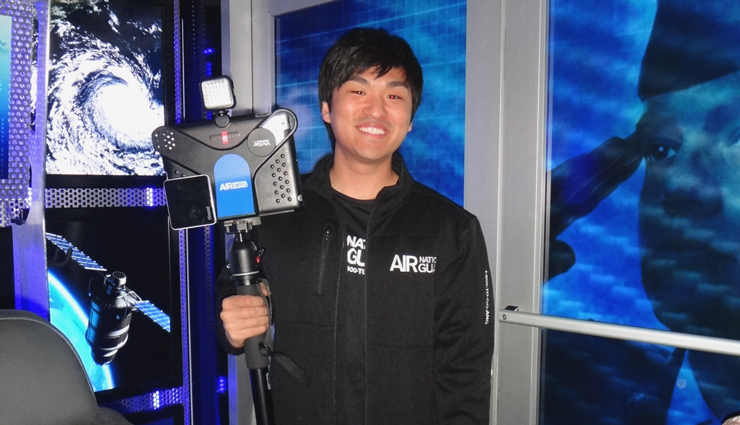 Consumers could participate at multiple stations onsite while competing for bragging rights as a top performer. Consumers registered by completing the survey on the iPads mounted on custom branded tabletop kiosks. The survey flows had dynamic branching logic allowing consumers to skip questions that did not pertain to them, speeding the registration process. A custom designed pass was created for the event and was worn by consumers as a “dog tag” on a chain. The QR Code on the pass was scanned at each station on the iPad and iPad mini linking the consumer’s data on the back-end. eshots reporting platform was able to monitor each consumer’s progress at different stations and tie their data together allowing detailed reporting from each event. A pull up bar was mounted in the display to challenge consumers on the total number of pull ups they could complete in one set. The Brand Ambassador scanned the consumer’s pass on the iPad Mini and entered their score on the survey. This process fed into the eshots platform, powering the post-event communications and online leaderboards. Two video games were setup onsite for consumers to play. Once the consumer finished playing the video game, their pass was scanned on the iPad Mini and their score was entered on survey, again, feeding the information into the eshots platform. Consumers could take their photos in front of a backdrop using an iPad with QuickCapture 4 software. The iPad was mounted on a tripod for stability. The Brand Ambassador scanned the consumer’s pass on the iPad and gave consumers the option to receive a link to their photo via SMS messaging or email. The survey generated the next questions based on the consumer’s response and asked the consumer if they would like to use the same email or phone number provided at Registration. Approximately 5,895 photos have been taken to date with a retrieval rate of 42%. Upon retrieval, consumers had the ability to share their photos via Facebook, Twitter, text messaging and email. eshots photo solution integrated with all other elements onsite allowing for maximum throughput and flexibility. As consumers completed their activities onsite, a recruiter was available to complete the exit interview process. The Recruiter scanned the consumer’s pass on an iPad and entered the recruiter’s unique code (AFRIS ID). The recruiter then had the ability to enter notes in an open text field of the survey and mark the consumer as a “pass through” for recruit by selecting “yes” or “no” on the survey. This survey has been extremely beneficial as it helps filter the consumers for a follow-up process. Scenario 1: Consumer only took a photo onsite. A Thank You email was triggered with a thumbnail of the photo prompting them to go to a microsite for retrieval. Scenario 4: Consumer only Registered onsite and did not partake in any activity. 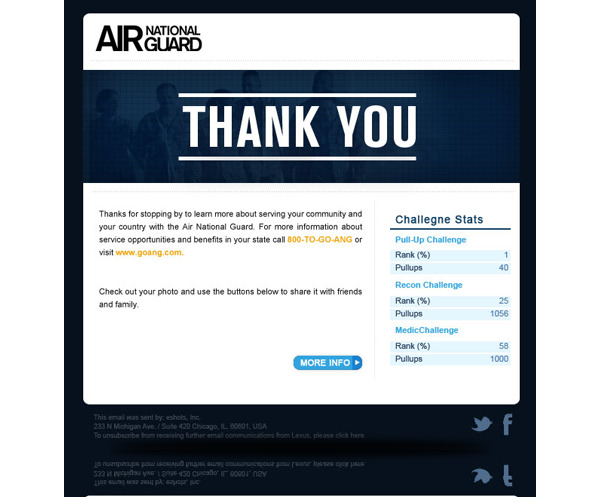 An Air National Guard logo was placed in the thumbnail driving the consumer to www.goang.com website. The microsite was built to showcase consumer’s rankings for each activity, for the duration of the campaign. A dynamic leader-board encouraged consumers to revisit the microsite and see their national rankings. As consumers continued to take the challenge throughout the 8 month tour the rankings continued to change. Consumers are able to log in at any time using the ID number on the back of their pass to see their updated ranking for each challenge. Another option to check the most up-to-date ranking is through the thank you emails that are sent. This functionality helped increase the total number of visits to the microsite to 28,654 which encouraged a healthy competition for the campaign. The photo taken at the event is also displayed on the microsite reminding consumers to share their photo via social media, viral email and text messaging. • Approximately 17,704 emails were sent with a delivery rate of 87%. • Click through rates of 60% with approximately 3,250 unique clicks. • Approximately 5,895 photos have been taken with a retrieval rate of 42%. • Total number of visits on the microsite to 28,654. Each consumer spent an average of 2 minutes on the site.